The 2017 Tax Cuts and Jobs Act includes a new tax credit for businesses that provide family leave benefits to employees. This tax credit is directed toward small businesses that aren't required to have a Family Medical Leave Act (FMLA) policy, to give these businesses an incentive to pay benefits to employees for family leaves. The tax credit is available for employee leave benefits paid to employees beginning January 1, 2018, but only through the end of 2019. What Is the Paid Family Medical Leave Tax Credit? The credit is a general business tax credit available to businesses that provide paid family medical leave for employees. 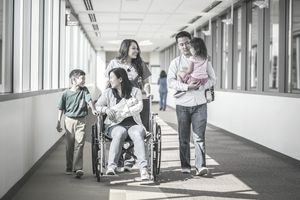 The policy must include at least two weeks of paid family medical leave each year for "qualifying employees" who are full-time (pro-rated for part-time employees). The amount of the payment must be la minimum of 50 percent of the wages normally paid to the employee. The two weeks of paid leave under this plan cannot be provided as vacation, personal, medical or sick leave. Your business can't use your current paid time off (PTO) policies for this tax credit. What Is a Family Leave Benefit? Any qualifying event due to an employee’s spouse, child, or parent being on covered active duty––or being called to duty––in the Armed Forces. This family leave plan should not be confused with the Family Medical Leave Act (FMLA) benefits legally required for larger businesses. Under this plan, businesses with 50 employees or more are required to grant eligible employees up to 12 weeks of unpaid leave for specific types of family leave. This law does not require employers to provide paid leave; employees can use any sick time, vacation time, or other paid time off during the leave. A qualifying employee is an employee who has been employed for one year or more. In addition, employee compensation in the previous year cannot exceed a certain amount. For 2018 this amount is $72,000, based on 2017 wages. So, if you have one full-time employee who has been employed for at least a year, who was paid less than $72,000 in 2017, and you paid this employee at least half of the employee's normal pay for at least two weeks of family leave, you get a tax credit. The IRS says that the tax credit amount is a percentage of the amount of wages paid to a qualifying employee while on family and medical leave. The tax credit is payable for up to 12 weeks of paid leave benefits in a tax year. The minimum percentage is 12.5 percent and is increased by 0.25 percent for each percentage point by which the amount paid to a qualifying employee exceeds 50 percent of the employee’s wages, with a maximum of 25 percent. In certain cases, additional limitations may apply. Taking the example above, let's say an employee is on family leave for 4 weeks and you paid the employee $1000 in family leave payments for that time period, which is 50 percent of the employee's wages. Since the payments aren't over 50 percent of the employee's wages, no tax credit is available. Take the amount that exceeds the 50 percent ($1500-$1000) = $500. Multiply that by 25 percent (the maximum percentage). The result is $125 in tax credit. There is one more restriction. An employer must reduce its deduction for wages or salaries paid or incurred by the amount determined as a credit. In the case above, for example, your business can't take a tax deduction for the $500 in wages paid that were used to determine the tax credit. Also, any wages taken into account in determining any other general business credit may not be used in determining this credit. How Does My Business Get This Tax Credit? The IRS is still working on more details on this new tax credit. As with previous tax credits, your business will probably need to file an application for the tax credit along with your business income tax return. What is an Acceptable Policy? Your business must have a policy in place (with either an adoption date or an effective date) before the paid leave process begins. Provide paid family and medical leave for at least two weeks (prorated for part-time employees). The payments for leave time must be at least 50 percent of the employee's normal wages. [Employer] will not interfere with, restrain, or deny the exercise of, or the attempt to exercise, any right provided under this policy. [Employer] will not discharge, or in any other manner discriminate against, any individual for opposing any practice prohibited by this policy. Begin by creating a written policy that includes the paid family leave benefit. Determine how much you will pay employees during their family leave. Remember that the tax credit is calculated only on benefits above the 50 percent required payment. You can announce the benefit at any time. Be sure you keep good records on payments. What’s Employment Practices Liability Insurance?